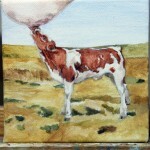 I’ve recently finished another small painting in the “In Our Veins” series. 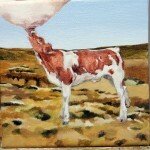 This one is titled “Trophy” and is 6 inches by 6 inches square, acrylic on canvas. I originally came up with this image while half-asleep- I often try to come up with concepts before falling asleep since it’s easier to be creative when you are relaxed. Anyway, the idea of these animal heads stacked on top of each other came to mind. 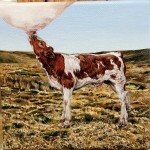 One of the concepts I explore often through my work is the use of animals as a means to an end. In other words, they are not beings, just parts- legs, heads, rump, ribs, etc. 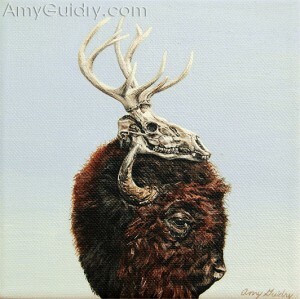 With this painting, I decided upon trophies since we (we as in humans- I don’t do this personally) place animal heads on our walls or in a display case as a source of “pride.” The stacking of the heads reminds me of totem poles, which in turn makes me think of Native Americans. They would kill animals, yes, but at least they were not wasting anything and they didn’t kill animals to serve as trophies. 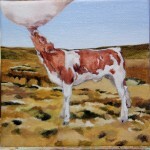 For a larger view of this painting, visit this direct link: AmyGuidry.com/Trophy. Be sure to check out the rest of this series while you are there. I’ve been tracking my website (www.AmyGuidry.com) stats for years, which is the only way I can know (other than someone telling me personally) that someone has been checking out my work. I’ve noticed that some sources that once were good generators of publicity, have fallen by the wayside a bit. I’m almost certain that this (yes, I hate to say it) is because as soon as the economy took a dive, many people were dropping their subscriptions and I think some were just less interested in purchasing artwork, therefore not looking it up on the internet so much, either. For instance, when I would have a feature article about my work in a magazine, I’d see a huge spike in my website stats. Now, not so much. So what does this mean? Well, for starters, now is the time for artists to up their efforts (if you haven’t already) when it comes to marketing your work. Studies have shown that those who keep marketing despite an economic depression, thrive later on because they have maintained their brand status while those that didn’t tend to lose customers in the long run. They appear less successful because they couldn’t “afford” (though you can market your work for free thanks to the internet) to advertise their product or services. And they were more likely to be forgotten because their name/brand was not being repeated. Also good to note here that it takes an estimated seven times for an ad to sink in to its viewers. So a one-time ad is most certainly not enough. Back to my personal findings- what has worked according to my stats is #1 Direct traffic. Which is great and should be your main effort because it means people are directly going to your site. You stand out to them, you are the authority to refer to, your art is memorable, etc. So this means that handing out those business cards is working. #2 is Google. Yes, it is “the” search engine according to my stats. I know that this is due to my web ranking. If you look up my name, my website is at the top. Not Facebook. This is good because you want your site to be the place people go to find you. Those social media sites are great, but again, you have to stay ahead of them in your rankings. That said, the rest of my referrals come from a mix of social media sites, blogs, websites, and emails (which may be direct traffic, basically, since I like to put my website at the bottom of my emails). I can’t say one is better than the other since they vary from month to month and even day to day. However, the good news is they are all free advertising. So there’s no cost to you (other than your studio time- so be careful) to “advertise” through all of them. Before I forget, I should clarify that this doesn’t mean I think you should abandon other marketing sources such as magazines, radio, newspapers, etc. I would advise using that time and money (if you are buying ads) wisely and pick and choose the ones that best suit your work and reach your target audience. I wanted to share one of my latest paintings from my “In Our Veins” series. 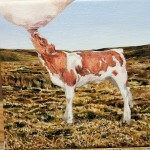 The title is “Mother Nature” and it is an acrylic on canvas, 6″ x 6.” This is one of the more overtly vegan paintings from the series. I’m disturbed by the fact that humans are willing to drink what is “breast milk” even though they are adults (and it’s not even from their own species!). Yuck. It’s no wonder so many people are lactose-intolerant… because it’s not natural! I wanted to create a piece around this concept, ironically naming it “Mother Nature” because there is nothing natural about it. That said, I have a few pics of my process to share. 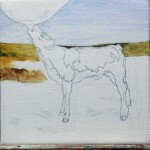 You can see the finished piece on my website at this link: www.AmyGuidry.com- Mother Nature. The Prospect New Orleans Benefit- Throwdown.1.5- last Saturday was a big hit. 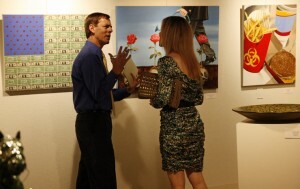 Many people were in attendance after the Julia St. Artwalk in New Orleans. 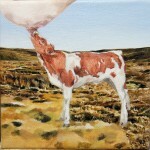 My painting “Kerry” now has a new home (see previous post). 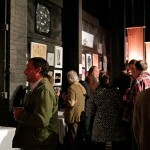 And I met some other exhibiting artists as well. 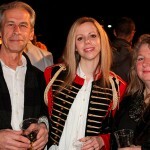 So if you missed the event, here are a few photos to enjoy the event vicariously. You can see more at this direct link: www.amyguidry.com/events.html. This weekend I will be one of the artists featured in the Throwdown.1.5 auction to benefit the Prospect New Orleans Biennial. 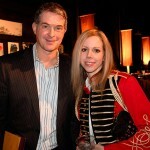 It’s for a great cause and it’s in New Orleans, so all the more reason to go! I am honored to be included amongst such great artists, some of which are from my own area. 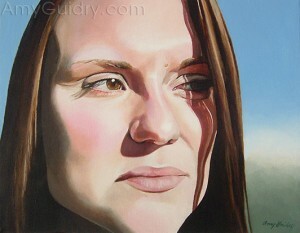 My painting “Kerry” from my 2005/2006 series will be up for auction. 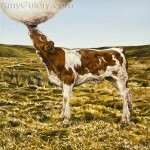 It is an acrylic on canvas, framed, and total size dimensions are 16″w x 13″h (view more of my work at www.AmyGuidry.com). The event will be held at Stage 3, Secondline Stages in New Orleans this Saturday, February 5th from 8-11pm. So if you are out and about for the artwalk, stop by afterwards. Tickets are available online at www.brownpapertickets.com/event/146659.